Turkish President Recep Tayyip Erdoğan has called on the US to extradite Turkish Islamic scholar Fethullah Gülen in return for releasing American pastor Andrew Brunson, who has been jailed in Turkey since October 2016. Erdoğan’s remarks came on Thursday during the police academy graduation ceremony in Ankara. Criticizing the US for not taking any action and remaining silent despite Turkey’s demands to extradite Gülen, who is accused by the Turkish government of mounting a botched coup attempt in July 2016, Erdoğan accused the US of trying to divide Turkey. “Some people are trying to divide us, crush us. But they will not be able to divide this nation and country, they will not be able to demolish it. They want a cleric from us, you have a cleric, too. Extradite him so that we can prosecute him,” Erdoğan said. Erdoğan has repeatedly called on the US to either extradite or detain Gülen despite not having submitted any evidence to the US that Gülen masterminded the failed coup attempt. Gülen called for an international investigation into the coup attempt while Erdoğan — calling the coup attempt “a gift from God” — launched a widespread purge aimed at cleansing sympathizers of the movement from within state institutions, dehumanizing its popular figures and putting them in custody. American pastor Brunson, who was jailed due to alleged links to the Gülen movement, was charged with acquiring secret political and military information, attempting to destroy constitutional order and overthrow the Turkish Parliament. 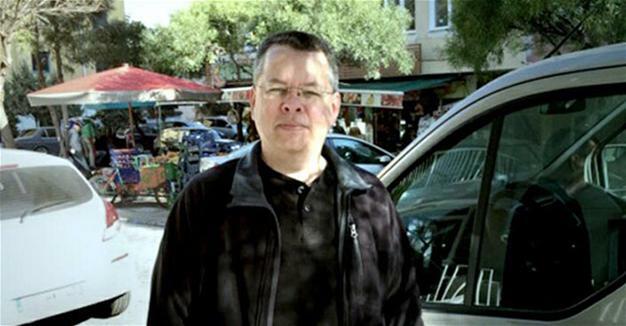 Denying all accusations against him, Brunson said he is a person defending Jesus, trying to establish churches in Turkey in accordance wlth the law. “I am not a member of an Islamic movement. I have never seen any member of FETÖ (a derogatory term invented by government to refer to the Gülen movement) in my life,” he said. Earlier in May, CNN Türk reported that US President Donald Trump asked Turkish President Recep Tayyip Erdoğan to secure to release of Brunson during his visit to the White House. A statement released by the White House also said Trump asked for Brunson’s release three times and his immediate deportation to the US during a meeting with Erdoğan. Brunson, a North Carolina native, has been in custody since October after he and his wife were detained on immigration violation charges. At the time, the Brunsons were running a small Christian church in İzmir. They had lived in Turkey for 23 years. Brunson’s wife, Norine, was soon released, but the pastor remained in custody and soon saw his charges upgraded to terrorism. Prosecutors have suggested in court hearings that Brunson is being held on suspicion of being a follower of Gülen. The pro-Erdoğan Takvim daily accused Brunson of being behind the coup attempt, claiming that he would be the CIA chief if the coup attempt had been successful. The arrest of the pastor has paralyzed CIA operations in Turkey, according to the article, and the US has been exerting all means to save him. This article originally appeared in Turkish Minute on Sept 28.